This final article in the series will wrap up some loose ends by offering suggestions on workflows (RGB vs. CMYK), monitor profiling and soft proofing, and setting up your Adobe software. To get started it's important to have a calibrated monitor. If the monitor is not calibrated, you have no way to know if what you see on your screen is an accurate representation of the intended color. And if soft proofing is something you want to do, then your designers and prepress need to have monitors that are regularly calibrated so that they have a basis to form critical color judgments. A casual search on the Web brings up a number of ways to calibrate your monitor, with many of them relying on you to evaluate colors with your eyes and make adjustments based on what you see - but a spectrophotometer is better for reading the color data, allowing you to make calculated adjustments rather than relying on your eyes. As noted in an earlier article in this series, our eyes are definitely not the best instruments to use when evaluating color objectively. One way to calibrate a monitor is to use i1 Profiler from X-Rite*. Part 3 discussed having the appropriate tools available to you for linearization and profiling, and some of those tools will also make monitor calibrating easy and painless. You can even set it to remind you to recalibrate on a regular schedule so that you will compensate for any drifting of the monitor colors. Make sure that you are calibrating the monitor in the same conditions as you normally will use it. Give the monitor time to warm up - 30 minutes is usually sufficient. Take note of a couple of the settings in i1 Profiler as you decide what is best for your workflow. The first is the white point - the default in the program is CIE Illuminant D65. If you will be using D50 for your lighting standard, it is a good idea to make that adjustment now. And the luminance setting default of 120 cd/mý is used to specify the brightness of the monitor. Most monitors arrive from the factory with a luminance of 200 to 300 cd/mý, so they will have to be adjusted. Another important setting is "gamma." A setting of 1.8 is a good for working in print (as opposed to 2.2 which is better when working to create images that will be viewed on screen). When you go through the calibration process itself, you will use the spectrophotometer device (hanging on the top of the monitor so that it is "reading" the color and brightness from the monitor), and one of the first things the software will instruct you to do is use the device to adjust the brightness. After that, follow the wizard's promptings and you will end up with a calibrated monitor. The new monitor profile will automatically be saved in the appropriate folder - I usually name it with the date that I ran the calibration. Now that your monitor is calibrated, let's turn to RGB vs. CMYK workflows. Many imaging companies have adopted the RGB workflow as their path for working with files to be printed, and for good reason. RGB files have the ability to produce images with greater color vibrancy and larger color space than CMYK files. In today's work environment, RGB source files such as digital photos, illustrations and stock art are habitually repurposed and corrected for printing from various output devices. Using a flexible workflow and master image, you can tweak the RGB files repeatedly to suit your output, and save time in having only one master file per project. The RGB color space is perfect to do everything you need, with its larger color gamut and dynamic range (compared to CMYK). In an RGB-preferred workflow, the master RGB image is quality adjusted and archived in RGB form. From there, duplicates may end up as a website graphic, a CMYK point-of-purchase (POP) display or a large billboard. Regardless of the output device used, you will be able to fine-tune the color reproduction for each output device. This is very different from the traditional offset-printing workflows, which typically require a tailored CMYK file for each CMYK printing device. Today's RIP software perform excellent conversions of RGB to CMYK, and the newer ink formulations will provide better and more vibrant output when you start with RGB content. 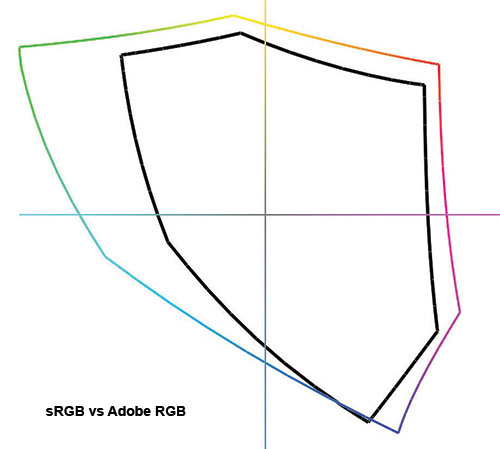 However, not all RGB is created equally, and it's important to understand the difference between sRGB and AdobeRGB. In Figure 1 it is quickly apparent that the sRGB color gamut is much smaller than the AdobeRGB gamut. sRGB is good for when you are designing for the Web as it defines a standard color monitor space and many digital cameras, and some scanners use sRGB for their default color space. However, when creating a file, you want as much color available as possible, so the Adobe RGB is a better fit as it has a larger gamut - particularly in the cyans and blues - and then you can rely on your RIP software to manage the color conversion to get the most color out of your print device. An important note about the CMYK color space is that many programs from Adobe will default to SWOP (US Web Coated) as their choice. 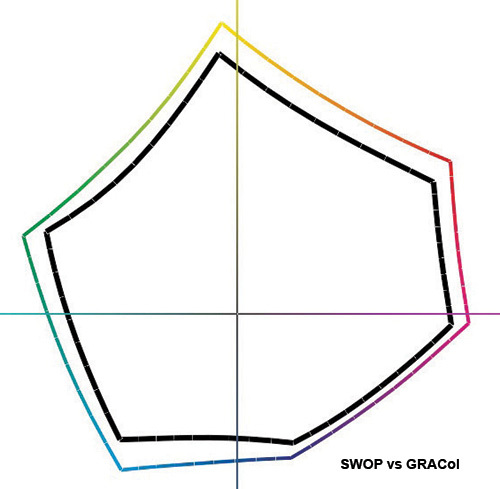 Figure 2 shows the representation of both a CoatedGRACol2006 and SWOP color space or target. As you can see, the SWOP target is smaller than the CoatedGRACol2006 target. There is also a GRACol Extreme target that is available. Most software will have CoatedGRACol2006 available, and if you want to use the GRACol Extreme then you would need to download it and put it in the appropriate profile folder (typically in Program Files (x86)/Common Files/Adobe/Color/Profiles/Recommended (for PCs). To make sure that your software is set up correctly, go to the Edit/Color Settings area and check your settings. North America General Purpose 2 (default for Adobe) will use sRGB and US Web Coated (SWOP) as the default color working space - Adobe Bridge will let you know if your programs are synchronized with their color settings. It's important to know and understand your application before deciding to make any changes. For in-house design work that will be printed, it's recommended that you make the changes stated previously. The important takeaway is to understand what is going on and where to go if you want to effect a change, and to have your software set up to preserve embedded profiles and to notify you when there is a mismatch. This will let you be aware of a possible color conversion when working with a customer's file. A calibrated or profiled monitor, capable of reproducing the full range of image colors as they will appear in the print. A printer profile. Ideally this should be a custom profile which has been specifically made for your particular output device's ink, paper and driver or RIP settings (see Part 3 with the color management pyramid). Color managed software must be used. This example is using Photoshop as the software for soft proofing. Soft proofing works in two parts that can be used together or not. Soft proofing simulates the out-of-gamut colors and displays the printer's color space (or your image) on the monitor, whereas the second part tries to simulate the dynamic range and white balance. It's really very easy to set up soft proofing in Photoshop. Under View > Proof Setup, slide directly over from Proof Setup to Custom. Choose your media/device profile in the "Device to Simulate" pulldown, leave Black Point Compensation on and preserve RGB numbers off. You can try the simulate paper color and simulate black ink if the results get you closer to the print. You will need to choose the rendering intent you will be using - this rendering intent should match what you have set in your RIP. Simulate Black Ink: This compresses the dynamic range of the monitors image so that it more closely matches that of the print. It works by lightening the image's black until the dynamic range more closely matches that of the print. No hard rule here; sometimes it will produce a better match to print depending on subject matter. Simulate Paper Color: This tries to simulate the color temperature of the paper's white point on the monitor. Hit CTRL + Y or Apple + Y to toggle the effect on or off. It's really that easy. With a calibrated monitor you should be able to get close to what the printed output will be, which will help you when you are creating files to be printed. And so we've reached the end of this series. Part 1 discussed color theory including how we see color, as well as a number of terms that will be helpful as you navigate the realm of color management. In Part 2, industry standards were introduced along with tools that will help you along in this process. Making the investment into a good spectrophotometer and then learning how to use it will be crucial to your success as will having a good light box or viewing area. Part 3 discussed the color management pyramid in great detail - a process that you can use as a guide for your color workflow. You need to have a process in place to ensure consistent and repeatable color, and the color management pyramid is a good start. And lastly, Part 4 talked about RGB versus CMYK workflows, monitor profiling and soft proofing. You will hear many different approaches and theories about color management. Some will argue about rendering intents and density versus spectral data. In the end, though, what you need to understand is what differentiates those viewpoints and come up with a plan that works for your applications and for your equipment. Use a practical approach and figure out what has been the most successful at getting the results you need. Getting lucky and hitting a bright red doesn't matter at all if you can't hit it again in six months. There is so much more information out there, but this series can help you understand some of the basic concepts and encourage you to explore color on your output devices. Good luck and go experiment with your color! Ray Weiss, Digital Imaging Specialist for SGIA, joined the Association in 2014. He provides solutions and technical information on digital printing as well as digital equipment, materials, and vendor referrals. He oversees several workshops at SGIA along with the association's digital equipment evaluation program. His 25+ year career in the graphics industry began with a typesetting and prepress business in Washington, DC, which grew into an offset print operation in Maryland. He then moved into wide format sales, training, support and service.